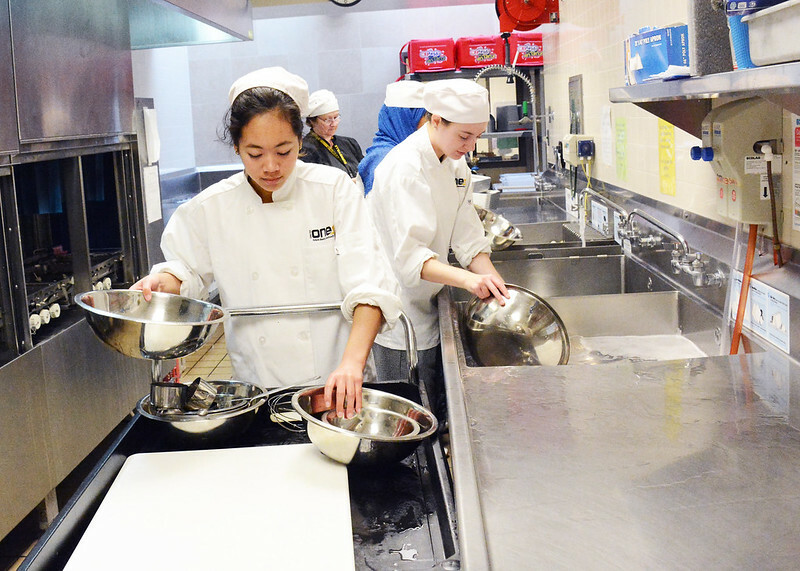 Burnsville High School hosted recipe testing for the 16th annual cookie contest of the Star Tribune newspaper last month, and students in culinary classes at the school were actively involved. Students worked with professional chefs to test the top 17 cookie contenders, and senior Abdi Abdullahi was selected to be one of the judges. Organizers of the event were Rick Nelson, a 1978 graduate of Burnsville High School who is the restaurant critic for the Star Tribune. He and Lee Svitak Dean, the food editor at the newspaper, recently co-authored a book, entitled the “Great Minnesota Cookie Book” about the first 15 years of the popular cookie contest. The testing was headed up by Amy Carter, executive chef of product development for Lunds & Byerlys. Carter said the kitchen at Burnsville High School is well-designed, organized and clean, and provided an excellent workspace for the event. During the two-day event, students weighed, measured and prepared ingredients, and assisted the chefs with production by mixing, shaping, baking and finishing the cookies. “Students were very interested in what we were doing and very focused,” said Carter who believes that students gained a better understanding of how important it is to pay attention to details by working side-by-side with professional chefs. There were nearly 200 entries this year, according to Nelson. The winning cookie and four finalists will be announced in the Taste section of the Star Tribune on Nov. 29. Deutsch, who is a trained chef in addition to being a licensed teacher, and Beth Asfeld, a family and consumer science instructor, offer a variety of culinary classes right at Burnsville High School as part of the Hospitality & Tourism pathway in the Business, Management & Entrepreneurship career field.